1. A fully charged mobile phone with a 12 volts battery is good for a 10 min talk time. Assume that, during the talk time, the battery delivers a constant current of 2 Amp and its voltage drops linearly from 12 volts to 10 volts as shown in the figure. How much energy does the battery deliver during this talk-time? 2. In the interconnection of ideal sources shown in figure, it is known that the 60 volts source is absorbing power. Which of the following can be the value of the current source I? 5. In the circuit shown, what value of RL maximizes the power delivered to RL? 2. 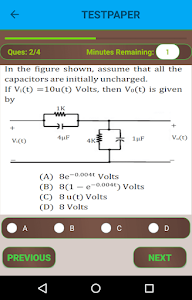 For parallel RLC circuit, which one of the following statements is NOT correct?